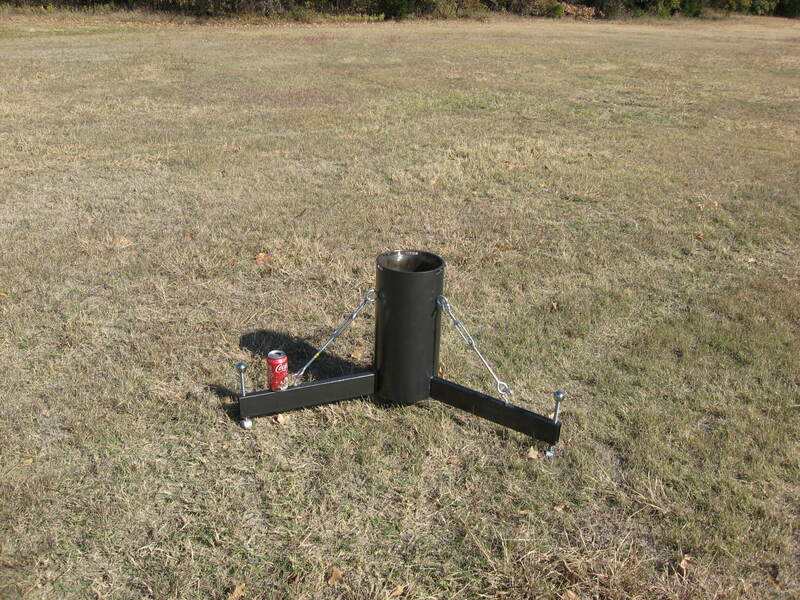 Variable capacity, portable or permanent, harmonic geared telescope mounts. Ideal for imaging. Cost for these mount is $6,000.00, delivered in the continental US. The closest competitor's harmonic drive mount starts at $14,000.00. The competitor's mount isn't portable either. More specs are at the bottom of this page. Custom orders are a specialty. See the partial list of options at the bottom of this page. Video of a mount moving 125 lbs. of simulated optics is below. The electronics are from Sidereal Technology, using servo motors with attached encoders. The controller software is ASCOM compatible and nearly un-used by the operator when a planetarium program is used. The pier can be included, a custom made top plate can be included, just send the specs for what you want. Dovetail plates can be made in house. Counterweights are typically only needed for optics weighing over 50 lbs. There are typically 10 ticks of the encoder per arc second. This pier comes with this mount. It is steel and comes apart for transport. No tools required ! Yes, the leg length can be specified, leg shape too, within reason. The mount has approximately 125 lbs. of weight added to the top of the Dec. axis. Scope is a little 6"F5 newt. The results were excellent. Daylight videos of the mount moving around with a simulated 125 lbs of weight is posted here and here on YouTube. A PemPro Periodic error video on YouTube. Custom Options - Each mount can be customized to a large degree. This is available at no charge when ordered, at our discretion. If you have need to mount 2 separate optics, or whatever, we can make the plate. Specify size, material and total weight needed when ordering the mount. They are included in the price. Stainless or Titanium counterweights are added cost items. Cast iron weights can be used to save costs. The mount uses a Sidereal Technology Servo Controller. Pictures, software screen shots and specifications can be see here. The best feature of the controller is that it can be replaced in a few minutes, negating the need to send the mount back if there are problems. You can download the servo software and play around with it at any time before you purchase the mount. Just send us an e-mail request for a link to the latest software. There is a Yahoo Group for users too. Here is another great feature of the software. It is called Point XP. This is part of the reason for the mount's accuracy. After an offset initialization, ( point and click on a star) you start adding in "cal stars". These are just plain stars that are centered on the CCD chip if you are imaging or in the eyepiece is you are doing a visual only session. After about 3 of them, accuracy is such that polar alignment drift is nearly canceled out, mount fabrication errors are compensated for etc. Pointing accuracy will put a star near center of a CCD chip. The better the separation of the cal stars, the better the accuracy. This is all done automatically. You need not even look at the PxP screen, just click on the button from the main screen when the star is centered. The recommended number of cal stars for the very best accuracy over the entire sky is 12. Accuracy is dramatically improved after 2 however. With these cal stars, Polar alignment does not have to be "perfect" anymore. Some of the polar alignment routines in other programs are rather lengthy and time consuming. With PxP, that can be eliminated. Each axis will be used when tracking. A Telrad is all that is needed for polar alignment. The software used is nearly transparent if you are using a planetarium. Screen shots are posted, here. The settings are saved on your computer in a file AND in the controller itself. You need not worry about having to fuss with the settings each time you go observing. The software is FREE with the mount and updates with new features are FREE. Temperature controlled focusing, motorized focusers, limit switches etc. can be controlled from the software. Different mount types can be controlled from the software and controller. Things like slew speeds, ramp speeds, backlash, power used etc. can all be controlled from this software. The motors are a big off the shelf motors with a 10k tick encoder attached. New, used, NOS can be requested. The gearboxes, one per axis, are a Harmonic Gearboxes. You can read about harmonic gearboxes here, here and here. Customers can request dual harmonic gearboxes for each axis. There is an added cost for this. A standard PE routine is used. Autoguiding from relays or from ASCOM can be used. PE testing reports will be posted after testing. Varies from order to order, but the mounts can be extremely small and made of aluminum or giant and made of steel. 1" -3" solid steel shafts are used on each axis. The pier adapter and bottom of the R.A. axis plate have been coated with an acrylic primer made for aluminum. This is the primer needed to keep regular paint on aluminum. Paint is a hammered rustoleum black. Power required is 12-24 volts DC. Cable is included. One end plugs into the controller, the other end has clips for attaching to a battery. A cigarette lighter male plug can be specified when ordering. 120 volt power inverters can be used too. Should you already have up to a 24 volt power supply, that can be used too. A minor change in the configuration is needed however. ( change a number in a box ). The software needed for operations is FREE. A laptop computer is needed for advanced operation. Either a Argo Navis or Sky Commander can be used too. There is a FREE planetarium program that works very well with this system. The cable from the computer to the mount is included. You do need a serial port on the laptop. A USB to serial adapter may need to be purchased. Bluetooth wireless serial adapters can be used to control the mount wirelessly. If requested, we can purchase and set up a laptop computer for operation of the mount. A wired handpad is included. A wireless handpad can be ordered, they are in stock. Cost is $350.00 each. A wireless bluetooth serial adapter can be used to control the mount remotely from a computer.